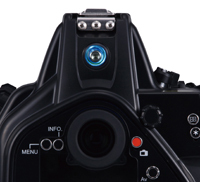 Compatible with new Optical YS Converter/C1 for RDX housing which converts the camera’s TTL signal to a light signal. Both TTL and manual strobe photography is possible using a Fiber-Optic Cable II. 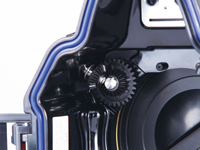 The gear mechanism is now similar to MDX series housings. 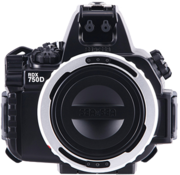 Perfect gear mesh enables accurate and quick zooming and focusing. Two Fiber-optic cable sockets. By inserting the Fiber-optic Cable into the housing connector, an external strobe will be optically connected to the camera’s built-in flash enabling full-featured strobe photography and creative lighting expression. Easily operated shutter lever, excellent for quick snapshots. 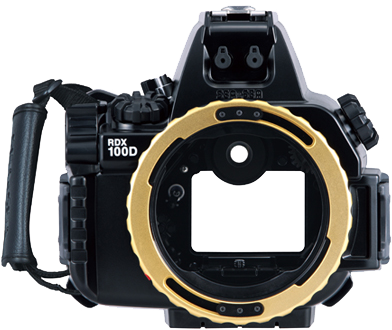 The shutter lever can be operated in two ways – pushing from the top or pulling from the front – and offers a smooth halfway press for adjusting the autofocus so you need not worry about any missed chances.